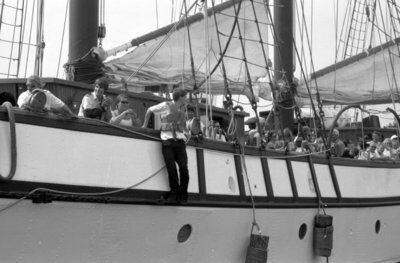 A black and white photograph of the crew and crowd on the Empire Sandy in the Whitby harbour. The Tall Ship Empire Sandy provided public sailings at Whitby Harbour Day. Whitby Harbour Day, July 28th, 2007, Carl Ferencz. Whitby Archives A2013_035_007C.